Ernest John (Jack) Moeran (1894-1950) was for a while, one of the brightest hopes for English composition. He was a good friend of Peter Warlock until the latter’s untimely death in 1930. The string trio stands as Moeran’s first mature masterpiece. The folk song arrangements are fascinating and performed by John Goss. Moeran regarded his song writing as his strongest skill and “Diaphenia” and “the Sweet O’The Year” performed by Heddle Nash, accompanied by Gerald Moore, are in fact the only Moeran original songs recorded in the composer’s lifetime. The prize on this disc is the Symphony in G minor – and this first recording, for many remains as the definitive recording – it is without doubt one of the greatest by any British composer. All tracks have been restored and remastered by Andrew Rose of Pristine Audio (apart from tracks 5 & 6 which were supplied by the British Library Sound Archive). 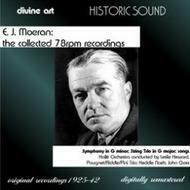 As a collection, they represent all of the commercial recordings of the works of E. J. Moeran made during his lifetime, and as such are of major importance.